Design your own MacBook case and protect your gadget in a unique style. Made from thick, spongy Neoprene, it protects your Apple product from scratches and daily wear and tear when on-the-go. The personalised MacBook case comes in two sizes to fit either 13" or 11", and offers a nice snug fit. Printed on the front and back with your unique photos, you also get to choose from four binding trim colours for that finishing touch. Two sizes for either 13" or 11"
Offering a great protection from wear and tear, your personalised MacBook Air case is the most stylish way to keep your gadget safe. Printed on both the front and back with your unique photos or designs, it's a gorgeous gift for anybody who loves their laptop. We use spongy Neoprene that effortlessly protects your gadget from scratches, and the two sizes are the perfect fit for both 13" and 11" MacBook Air. Two sizes for 13" and 11"
I received my laptop sleeve very promptly, I am very happy with the print of my photos. Front and back. Very good quality, padded soft. My partner was very surprised and happy. Excellent. Would definitely recommend! Excellent Product! Well happy with the pictures and quality. Highly recommended! Product quality is difficult to discern; in terms of the print it is very good, but wear and tear is yet to be seen. Service was extremely good however :)!! Like many of our products, your personalised MacBook case comes with a quantity discount, allowing you to create one for the whole family and save money at the same time. Your personalised MacBook case is expertly handmade to order in London, UK, by our team of textile specialists. We print onto two separate layers of neoprene, which means the front and back can have a completely different image or design. The material is cut to size and hand sewn together. To cover the hemming, we stitch a decorative binding trim over the top, in either black, green, stone or maroon. The zipper runs just passed the curved corners, so you can easily remove your laptop. 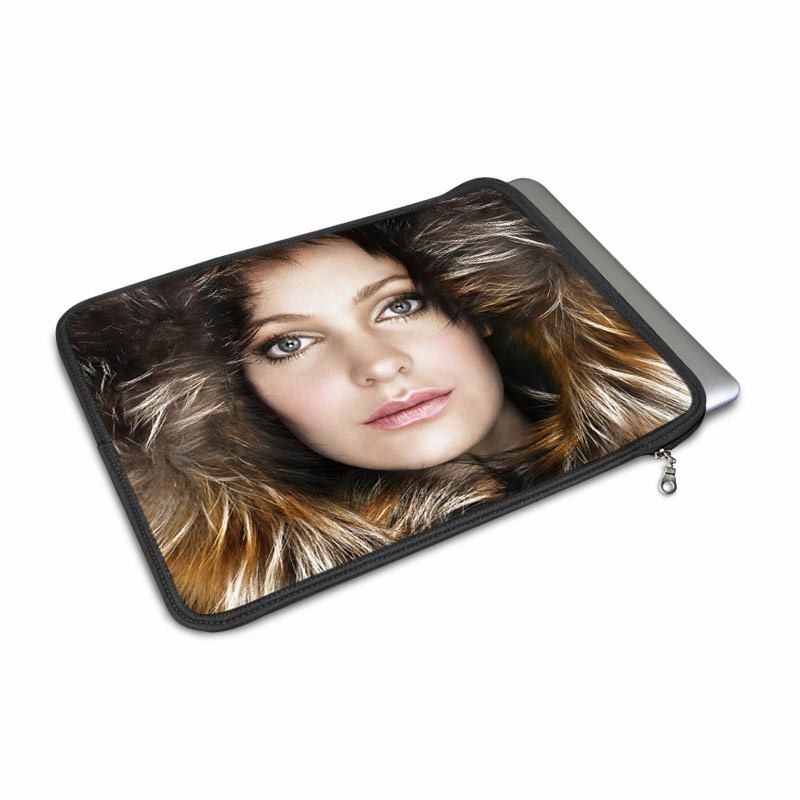 Care: Your personalised neoprene MacBook Air case is water absorbent and can easily be surfaced clean with a damp cloth. Each side is customised separately, so why not give the front and back their own individual look? Design your own MacBook case featuring completely different styles on either side and get two in one. Or another idea is to print a message on the back and a favourite photo on the front. This is especially good if you're making one for a unique birthday or Christmas gift. Print your husband's name on one side and a photo of your family on the other, so whenever he's away at work, he can take you all with him and be reminded of your smiles at all times. A personalised MacBook case like this is sure to be his new favourite business accessory. A fun idea is to surprise your loved one with a personalised MacBook Air case featuring your child's hand drawing. Adorable, cute and totally original, it's a sweet gift that is both practical and sentimental. If you've got a beloved pet, you should design your own MacBook case featuring their adorable face. When you're at work, it's guaranteed to brighten up your day and remind yourself of what's waiting for you at home - lovable cuddles.